Bringing elegance and geometric design together, Handy Dryers are proud to have been selected as one of TOTO's exclusive UK suppliers. The signature of a truly superior washroom, TOTO hand dryers are developed by one of Japan’s most iconic manufacturers – and the manufacturer of the quietest hand dryer in the world. Indeed, TOTO’s hand dryers are considered some of the most sophisticated ever invented. Synonymous with cutting-edge bathroom technology, TOTO is the first and only washroom supplier to have a museum dedicated to their innovation. 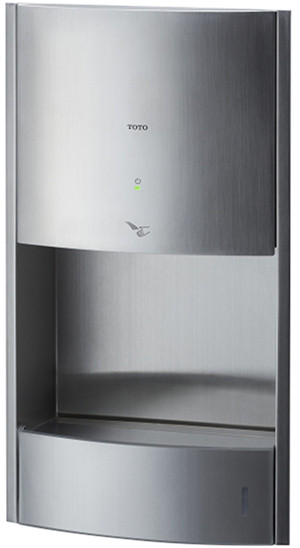 The TOTO TYC604 is the only recessed hand dryer in the world to collect waste water. A concealed 0.95l drip tray subtly gathers excess water, keeping bathroom walls and floors moisture-free. Touchless technology and an easy-to-clean stainless steel casing compliment the TOTO TYC604’s tech to make it an attractive and impeccably hygienic machine. The TYC604 affords users the near-clinical sterility expected of any stylish washroom. Designed to prevent water droplets contaminating spotless washroom walls and floors, the TOTO TYC324W’s integrated 0.7l drip tray is precisely contoured to direct moisture away from the user. Scraping all excess water from wet hands within 9 seconds, the TOTO TYC324W is a super speedy performer. 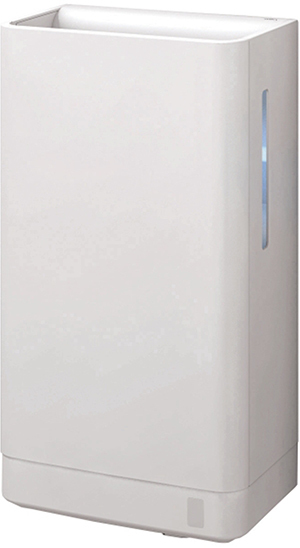 This outstanding dryer finds instant favour with your customers and helps you keep on top of your energy bills. With all the pristine minimalism you’d expect from Japan’s iconic washroom manufacturer, TOTO’s enclosed, hands-in TYC424W rises just 186mm from washroom walls. A smooth, wipe-clean polypropylene casing, automatic sensor technology and removable side panels keep your bathroom surroundings free from bacteria. Emitting as few as 54dB of sound while operating, it’s the quietest hand dryer in the world. Handy Dryers are proud to have been selected as one of TOTO's trusted UK suppliers, and we're the only supplier in the country to sell all three of TOTO's iconic hand dryers. 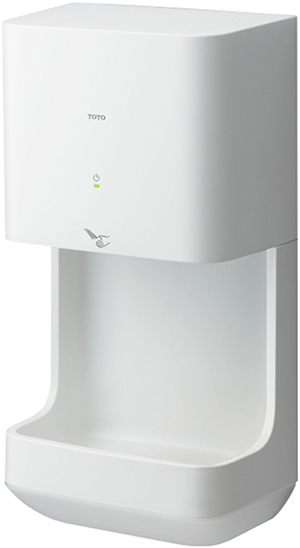 Developed by discerning Japanese engineers, TOTO hand dryers offer an unparalleled level of hygiene control. Each of these blade dryers includes a clever integrated drip tray which is ultra-discreet, and easy to empty, sterilise and re-insert with simple efficiency. Touch-free, and finished in either stainless steel or robust polypropylene, TOTO hand dryers are incredibly easy to keep clean. With their revolutionary design and lightening-fast drying times, TOTO technology has long been regarded in Japan as the pinnacle of washroom design excellence. That reputation has already started to earn TOTO products a strong presence in some of Europe's most innovative developments – from the renovation of The Louvre Museum's Hall Napoléon in Paris, to London's latest Aston Martin boutique at No. 8 Dover Street. Sponsorship of the 2018 Rugby World Cup and 2020 Olympics further bolsters the TOTO brand. Futuristic looks aside, a TOTO hand dryer really sets your washroom facilities apart, elevating them from merely functional spaces to environments of pure luxury and aesthetic beauty.